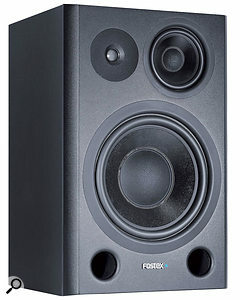 If I'm asked to suggest capable studio monitors at the budget end of the price range, the Fostex PM series of two-way speakers always end up on my list, and the range has recently been augmented by the first active three-way monitor, the PM8.4.1. Finished in an unassuming black, the ported cabinets are joined by a matt-black baffle. Each speaker measures 70 x 432 x 290 mm and weighs 13.4kg. There's nothing really radical about the design, which is centred around an eight-inch woofer powered by a 60W amp, while separate mid-range and high-frequency drivers each have their own 18W amp. The four-inch mid-range driver has a separate acoustic enclosure, and the highs are accommodated via a 0.75-inch soft-dome (Urethane Film Laminated Cloth) tweeter. The woofer cone and the mid-range diaphragm are formed from Kevlar and paper, so they're both stiff and light. A three-way crossover feeds the different power amps, and a frequency response of 50Hz to 25kHz (±3dB) is achieved. Rear-panel controls include three HF settings (+1/0/-1 dB at 10kHz) and three LF settings (+3/0/-3 dB at 60Hz) that can be used to adjust the monitors' tonality to suit the room acoustics or user's preference. A finned heatsink protrudes from the rear, and there's also a rotary control to set level. Both balanced jack and XLR analogue inputs are provided. Power comes in via the usual IEC socket, and a front-panel LED lets you know whether the speakers are switched on. I tested these speakers with a variety of material, and they have what I'd describe as a typical Fostex PM-series family sound. For those of you unfamiliar with this range, this means that they're pretty well balanced, with the lows being adequately deep and reasonably tight-sounding, given that this is a ported cabinet. The addition of a separate mid-range driver gives vocals and other mid-range sounds a more natural and open tonality than the two-way versions, and also allows the HF crossover frequency to be set higher, so that the tweeter is better able to operate in its comfort zone. I'd describe the HF character as crisp, but it's not overbearingly aggressive. Being realistic, I'd say that the tonal balance is pretty much what most users seem to expect from a near-field speaker these days, with slightly larger-than-life highs helping to get transient detail across. The imaging is good, and although the bass end from any ported cabinet tends to be a touch 'plummy' unless it's very well damped, there's no sense that the lows are in danger of running out of control. There's a decent sense of focus, too, with good definition between instruments. These monitors fall into a price bracket between entry-level monitors and what we think of as more serious speakers, so they should attract a lot of attention from those on a budget who want something a little better and are prepared to pay just a little more for it. While more expensive speakers will obviously do better in respect of both focus and bass tightness, the PM8.4.1 is certainly a speaker I could mix on and feel confident that the results would translate to the outside world. £499 per pair including VAT.